The Samsung Galaxy S II is gearing upfor prime time, and as it's being rolled out for pre-order in various countries, it got its first commercial focusing on the handset's vivid SuperAMOLED Plus display. Just how vivid is it? 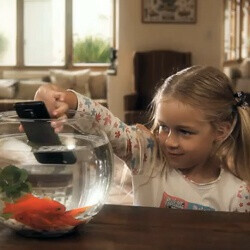 This ad aims to convince us that it's too realistic - enough to fool a kid the fish on the screen is real. With this being said, don't leave your kids dropping your phone into the fish tank as the awesomeness of punchy colors on the 4.3-inch screen of the Galaxy S II comes for a retail price comparable or even surpassing that of a notebook. Skip back for the full video below, but if you want more than your usual market speak about the wonders of Super AMOLED Plus, feel free to also check out our cold-blooded comparison detailing its pros and cons over some of the hottest screen technologies like iPhone's Retina Display and Super AMOLED. Stupid commercial. I think they could have come up with another example to demonstrate the vividness of the Super AMOLED that wouldn't involve dropping the phone in water! Sammy, show your customers how the phone should be used, not the last thing in the world you should do to it! Luckily, Android users are smart enough to heed the warning in the commercial and know better than to drop it in water. iPhone couldn't run a commercial like this because the iDrones would start using their iPhones in the shower thinking it's waterproof lolololol. I know I could have come up with something way better than that. I guess Samsung is prepping for much better commercials by dropping this crap. Only time will tell! lol What I really hope for is better software support in the U.S. Samsung STILL has a Galaxy S phone with 2.1. Poor Verizon Fascinate owners it looks like you will get Gingerbread before Froyo. Hopefully. My friend is bald now because every day he pulls his hair out because STILL there is no Froyo update. I really think this is the only Galaxy S phone in the world still running 2.1. This is a must buy for me. I'm certain this phone will be one of the best selling phones ever. Good job sammy. So proud of you guys. I can't continue to wait for nokia. Maybe by next year, I'll consider any of their top notch phones. Android, here I come!! !